Spy photographers have caught up with the forthcoming Audi A3 undergoing testing in Germany. The outline of the new A3 is instantly recognisable, although it will almost look like an enlarged A1, with a single frame grille, flag-like door mirrors, and a fascia that draws from the new Audi line-up. The interior will be lavished with high-quality materials and like the exterior, mimics the A1's cabin. As the test engineer exited the vehicle to smoke, he left the dashboard completely exposed and left the door wide open. Power will come from a range of three and four-cylinder petrol and diesel engines and a hybrid or plug-in hybrid is said to be in the works. 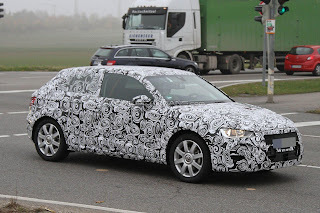 More variants of the A3 will be added, with the S3 due in Winter 2012 and the RS3 due in early 2014. The former may use an updated 2.0 litre TFSI unit with around 276bhp (280PS/206kW) and 350Nm (258 lb-ft) of torque.